With auto collisions on the rise, we want to help you and your family stay safe. Learn more about the recent spike in car crashes and more importantly, what you can do to help drive change. 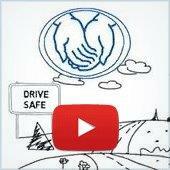 Allstate has a rich history of helping keep roads safe. For 30 years, we have partnered with MADD Canada to spread awareness on impaired driving. We work to educate Canadians about safe driving habits through our annual Safe Driving Study, our Just Drive distracted driving campaign, and through programs for teen drivers funded through The Allstate Foundation. Put down your phone: Your phone is full of distractions — texting, talking, Facebook, Instagram, Snapchat, and your GPS — just to name a few. A NHTSA study showed that nearly 80 percent of collisions and 65 percent of near collisions involved some form of driver inattention up to three seconds prior to the event. Keep your hands on the wheel, your eyes on the road, and your focus on your driving. Slow down: It can be tempting to speed up when road conditions are clear and dry, but the faster you go, the longer it will take to stop, and the more severe a collision will be. By slowing down, you can reduce your likelihood of being involved in a crash. If you have to come to a sudden stop, slower speeds will make you less likely to hit the car, pedestrian, or object in front of you. Never drive impaired. On average, approximately four people are killed each day in crashes involving alcohol and/or drugs in Canada. If you plan to consume alcohol or drugs, make sure you plan for your ride home. Public transit, a designated driver, a taxi, or a rideshare are just a few options to consider. If you suspect another driver to be impaired, call 911 and report it. Use technology to your benefit: While certain technology can be distracting, some can help protect you. Drivewise ® is state-of-the-art technology that promotes safe driving awareness, which can help saves lives and reduce losses on the road. Save up to 30% on your auto insurance*. If you haven't yet, download our Drivewise app to help make you more aware of your driving habits. *Feature is optional. Subject to terms, conditions and availability. Savings apply to major coverages only. Trademark owned by Allstate Insurance Company used under licence by Allstate Insurance Company of Canada. © 2017 Allstate Insurance Company of Canada.